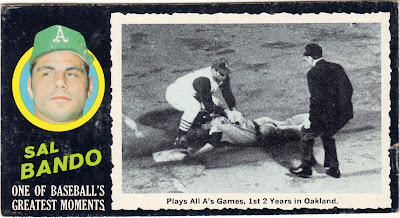 The Fleer Sticker Project already wrote the intriguing story of how Topps made Fleer wait on their own highlights set by putting out this horizontal test issue of active players doing notable things, so check it out for some cool card history. 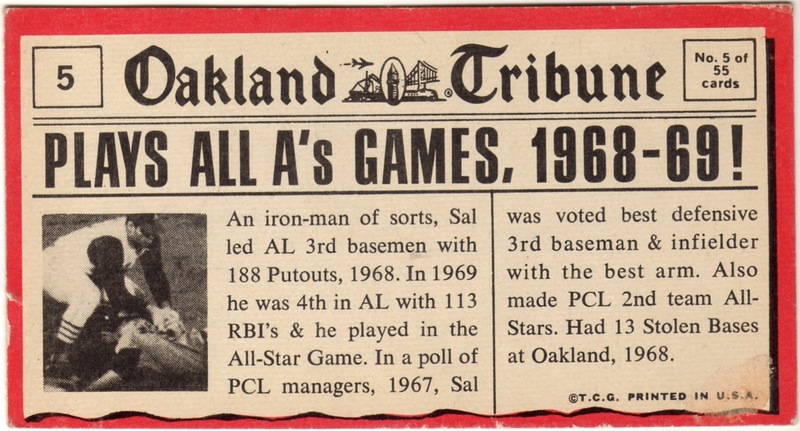 Fellow card blogger Dave Hornish (who wrote the history of Topps special issues and now runs The Topps Archives) called today's horizontal highlight set curiously unpopular, considering its black border style (similar to the well-liked 1971 regular set), multiple photos, and interesting newspaper presentation. So what would have worked with collectors? Something with a standard size that highlighted specific great performances in color sounds better to me. Black-and-white photos work better as a real look into the past (instead of recent history), as Topps did with their boyhood series in 1973. Value: Sal cost $5 at a show several years ago and runs about the same now.